Confirm current licensure and practice. Update contact information so you can be reached for important certification information. Pay the $110 credentialing fee for the upcoming two years — the same fee amount and timing as in the past. Check CPC Program compliance progress to make continuing education plans for the next two years. Class A or B credits (or Core Modules) are not required at the check-in. This quick and easy online process only takes about 10 minutes and can be completed on a computer, cell phone or other mobile device. Use the following link to connect to the two-year check-in online portal: https://portal.nbcrna.com/. Your two-year check-in deadline will depend on your 2017 recertification or certification date. 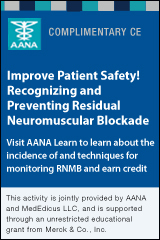 Find a two-year check-in deadline chart, FAQs, videos, and more at www.nbcrna.com/2YCI. Whether you have questions about your current policy or are interested in applying for new coverage, AANA Insurance Services will be on-site at #AANAMYA (April 6-10, 2019, Washington, D.C.) to assist with all of your malpractice insurance needs. Caring has its risks. Let us help safeguard your career. Learn more. Earlier this year, Anesthesiology News reported, "A comprehensive study has yielded potentially alarming findings regarding the ease with which the hepatitis C virus (HCV) can be transferred from sterile needles and syringes into medication vials if the diaphragm is already contaminated. The study also found that common vial-cleaning practices are not enough to eliminate HCV infectivity. Learn more. As legislative and regulatory challenges at the state level continue to increase in frequency and intensity, involvement with your state association plays an integral role in the development of healthcare initiatives. Visit State Association Advocacy Resources (login required) to better understand the issues affecting your state and region; and for action-oriented toolkits on a variety of issues, the "State Update," published quarterly, and an interactive map highlighting the status of all state bills being tracked by the AANA, in your state and nationwide. Learn more. The AANA Connect 2019 Board Candidate Forum will be available beginning April 8, 2019, for members to interact with candidates for the AANA Board of Directors. View the 2019 Election Slate and find information about voting in the Election Center on AANA.com. SRNA Excellence: Who is Deserving of the Student Excellence Award? The Education Committee is looking for student registered nurse anesthetists (SRNAs) to consider for the Student Excellence Award. One student will be chosen from the nominees and receive the award at the 2019 AANA Annual Congress. The winner will be recognized at the Student Luncheon. The student must be nominated by the program administrator or the program administrator’s faculty designee. All individuals who are a student at the time of the submission deadline are eligible. Record of extracurricular activities or other contributions to the college or community. Consistent excellent performance in the clinical setting for at least two semesters. Submission must be a narrative of no more than 1,000 words. The narrative should provide specific details on how the student demonstrates excellence in leadership, scholarship, service or a related area. Nominations must be submitted via e-mail to the Education Department at education@aana.com by April 22, 2019. Please direct any questions to the Education Department by e-mail or at 847-655-1161. LCDR Chad Moore, DNP, CRNA, has been named to the Great 100 Nurses of Northeast Florida. Moore is the site director for the nurse anesthetist training program at Naval Hospital Jacksonville in Florida. He is one of four nurses at the facility to be selected for the award. The award recognizes nurses who have demonstrated outstanding contributions to the patients and families for whom they care, the profession as a whole, and the community in which they live. Learn more. Neck of the Woods Brewery, Pitman, N.J., is heading toward a late April opening, and part of the team behind the brewery is Frank Price, MSN, CRNA. One of his friends, who is also part of the brewery's team, was given a $60 plastic beer brewing kit one Christmas, and the group of friends started experimenting and brewing, eventually taking the leap into making their experiments into a bonafide business. "Frank shared how the initial brewing experiments quickly moved to his garage," reports 42freeway blog, "and how his garage became the meeting place for the friends who later became Neck of the Woods." Learn more. Students and CRNAs Needed for the Anesthesia College Bowl! The Anesthesia College Bowl is a spirited event held every year at the AANA Annual Congress. Six teams of six students each compete to answer questions about anesthesia that have been submitted by nurse anesthesia program directors. The winning student team then plays the six-member CRNA Challenge Team to determine the ultimate winner of the College Bowl. The winners hold bragging rights until the following year! Students wishing to play must inform their program administrator, who can submit a maximum of two students to participate. The submission form is available on the AANA website under CE & Education > Education > Opportunities for Educators. CRNAs who wish to play must submit the Challenge Team sign-up form available on the AANA website under CE & Education > Education > Opportunities for Educators. The submission deadline for students and CRNAs is May 6, 2019. Please direct any questions to the Education Department at education@aana.com or 847-655-1161. Take advantage of your refund now by investing in your home or paying down debt through a refinance. Or, set up a down payment fund to purchase your dream home. When you purchase or refinance through Quicken Loans®, you can enjoy even more of your refund by receiving $500 cash back after closing, plus up to $1,000 in closing cost credit.1 Start planning today by calling (855) 245-5911. United Anesthesia – Various Locations. United Anesthesia has been a leading CRNA and Anesthesiologist Locum Tenens and Permanent Placement firm in the country for 40 years. By specializing in only anesthesia placement, we can partner with you to find the ideal situation to suit your strengths, your priorities, your dreams. Your dedicated personal coordinator is looking forward to your call! Learn more. The AANA is an organization that is in active transformation, so this is the kind of opportunity that doesn’t come around often. We’re looking to add a talented individual to join a dynamic group of professionals who are deeply dedicated to advancing the nurse anesthesia profession. While work experience and educational preparation are certainly important, we don’t hire resumes here at the AANA, we hire talented individuals based on our culture and values first. The AANA is recruiting for a gifted Senior Director of Practice Management. This person must have an energetic personality, knowledge of the changing healthcare landscape, and passion to lead and move the organization forward. The new mantra for the AANA is “experiment, fail, learn, and repeat,” and the Senior Director of Practice Management needs to be comfortable working in that kind of environment. All staff is expected to foster a workplace culture that promotes divergent thinking, openness, respect, trust and the desire to be epic. The Senior Director of Practice Management leads the Practice Management Department in clinical practice, practice management, facility accreditation, patient education, peer assistance, health and wellness, advocacy, and workforce optimization initiatives as well as assists members through inquiry response and support. Learn more. The Division of Anesthesia for Nurses (AFN) invites applicants for a faculty member position. We are seeking a motivated Certified Registered Nurse Anesthetist (CRNA) who has demonstrated skills in nurse anesthesia education and clinical practice. Qualified applicants must have a minimum of three years of clinical experience; graduate preparation in the basic and clinical sciences relevant to nurse anesthesia practice; and prior classroom teaching experience. Applicants must also have knowledge of Certified CRNA practice and professional issues and must possess active recertification as a CRNA. Responsibilities will include teaching in the nurse anesthesia program, curriculum development, scholarship and doctoral student advising. The most qualified applicant will have experience in teaching the basic sciences and anesthesia principles. The position also involves related duties such as college committee work, departmental duties, and continuing professional development. Faculty clinical practice is required with contracted time at MUSC. Learn more. The Certified Registered Nurse Anesthetist (CRNA) is a licensed registered nurse with advanced specialized training in the administration of anesthesia. The CRNA administers, monitors, and adjusts anesthetic doses to individual patients, from neonatal through geriatrics, during surgery and other procedures. The ideal CRNA candidate is certified to practice in the state of Texas and is adept at administering anesthesia using a variety of techniques and equipment; and communicating effectively with clinical staff and physicians. Learn more. Busy outpatient surgery center in South Carolina near coast looking for a full-time CRNA. Case mix includes all ambulatory procedures to include Endoscopy, General Surgical, Orthopedics, Plastics, Hand, Eye, Podiatry, Pediatric Dental and ENT, Pain management. Work 5 days per week, no weekends, no call duties. Cases go from 7-7:30 a.m. until 3 p.m. on average. Job is W2, includes insurance benefits, retirement, and vacation. Team anesthesia practice: anesthesiologist supervision for every case. All subspecialties with established surgeons and surgery center is majority-owned by physicians. CRNA with PALS and ACLS, preferably with South Carolina license, but that is negotiable. New grads may apply. Learn more. Evidence suggests that dexmedetomidine can lower the amount of barbiturate needed to achieve pediatric sedation for magnetic resonance imaging (MRI). Researchers performed a retrospective chart review of 200 patients, half of whom received intranasal dexmedetomidine—a highly selective alpha2-adrenoceptor agonist—45 minutes to an hour before undergoing MRI. The control group, meanwhile, received only thiopental for procedural sedation. Additional intravenous thiopental was administered to all patients, as needed, to maintain sedation. The results of the review indicated that intranasal dexmedetomidine significantly reduced the cumulative thiopental requirement needed for adequate sedation. Children who were premedicated with dexmedetomidine prior to MRI required only a median 4.4 mg/kg of thiopental per hour versus 12.4 mg/kg in the thiopental-only group. Other findings show that about a third of the control patients required supplemental oxygen versus 2 percent of the dexmedetomidine group. The lowest measured peripheral oxygen saturation was slightly higher in the intervention group, which also had the lowest measured heart rates. From "Premedication with Intranasal Dexmedetomidine Decreases Barbiturate Requirement in Pediatric Patients Sedated for MRI"
Researchers studied changes in suicidal ideation among veterans with comorbid post-traumatic stress disorder (PTSD) and major depressive disorder (MDD) who were treated with I.V. ketamine. The team from the University of Minnesota Medical School worked with 15 veterans meeting the patient profile. Each study participant received six repeated infusions of 0.5 mg/kg of ketamine on a Monday-Wednesday-Friday schedule. Immediately prior to each infusion and 24 hours afterward, they were evaluated using scoring systems for depression, suicidal ideation, and PTSD. Patients with both PTSD and MDD are three times as likely to take their own lives as patients with just one of the disorders, the investigators noted, but ketamine infusions markedly reduced their suicidal ideation. A significant improvement was observed in the first 24 hours after the initial infusion and was maintained at all other post-infusion time intervals. Moreover, at the last infusion of the 12-day treatment period, suicidal ideation was associated with PTSD subscales of avoidance, negative alteration in cognition and mood, alterations in arousal and reactivity, and pain independent of improvement in depressive symptoms. The findings were presented at the Anxiety and Depression Association of America annual conference in Chicago. From "Ketamine Improves Suicidal Ideation in Veterans with PTSD, MDD"
Cleveland Clinic researchers report that paging clinicians when mean arterial pressure, bispectral index, and minimum alveolar concentration levels all fall does not appear to prevent death after noncardiac surgery with volatile general anesthesia. Led by Daniel Sessler, MD, the team considered 7,569 clinic patients who experienced a so-called triple-low event and were randomized "on the fly" to a real-time alert or not. The question was whether notifications to the electronic health record and pages to both the in-room clinician and attending anesthesia provider had an impact on 90-day postoperative mortality rates. The answer was "no," with deaths occurring at a rate of 8.3 percent deaths in the alert group compared with 7.3 percent in the non-alert group. The investigators also observed that clinicians' responses were similar among patients who did and did not receive triple-low alerts. "Clinicians were free to act on the alert if they deemed it appropriate, but they were not required to respond in any particular way," Sessler explained. The study data show that they either administered vasopressors or scaled back anesthetics in 51 percent of patients who received alerts—only 4 percent more than those that did not generate alerts. "We therefore conclude, based on previous work, that triple-low events predict mortality and, based on current results, that neither alerts nor interventions for triple-low events reduce 90-day or 30-day mortality," Sessler said. From "Triple-Low Alerts Do Not Reduce 90-Day Mortality"
Preoperative mirtazapine may work as well as ondansetron in curtailing postoperative nausea and vomiting (PONV), findings from a meta-analysis suggest. Researchers reviewed seven randomized controlled trials that compared the drug with placebo, no treatment, or another antiemetic agent. Three of the studies observed a significant benefit in mirtazapine over placebo, with PONV down by 56 percent in the active treatment group. Another investigation found mirtazapine to have similar efficacy as ondansetron. Compared with both placebo and ondansetron, meanwhile, mirtazapine calmed preoperative anxiety and markedly reduced the incidence of pruritus. There were no meaningful differences in other secondary outcomes, including dry mouth, postoperative pain, and postoperative morphine demand. There was, however, a strong correlation between mirtazapine and sedation, according to the report in the Journal of PeriAnesthesia Nursing. "Further studies are needed to investigate comparative effects with other antiemetics, improve methodological conduct, and determine whether the sedative effects of mirtazapine affect clinically important outcomes such as respiratory depression," the investigators concluded. From "Mirtazapine May Reduce Postop Nausea, Vomiting"
A German study compared outcomes after total knee arthroplasty (TKA) with local infiltration anesthesia (LIA) versus a combination of two ultrasound-guided nerve blocks. All participants received general anesthesia. After randomization, however, 20 participants had their operation with LIA of the knee capsule administered at the end of the procedure using 150 ml of ropivacaine 0.2%. A like number of participants underwent surgery with a single-shot sciatic nerve block with 20 ml of ropivacaine 0.75% plus an adductor canal block with a catheter placed for no more than four days. The catheter provided an infusion of ropivacaine 0.2% at 6 ml per hour. The main outcome was time from end of surgery to patient mobility, with postoperative pain and patient satisfaction as secondary endpoints. Both analgesic approaches allowed patients to start walking again within similar time frames: 24 hours for the LIA group and 27.1 hours for the nerve block group. Patient satisfaction, postoperative opioid consumption, and resting pain levels also were comparable between the groups. LIA, meanwhile, was associated with a shorter anesthesia induction time; but maximum postoperative pain scores on exertion and intraoperative opioid requirements were lower in the nerve block group. From "Local Infiltration Anesthesia Versus Sciatic Nerve and Adductor Canal Block for Fast-Track Knee Arthroplasty"
European Journal of Anaesthesiology (04/01/2019) Vol. 36, No. 4, P. 255 Kastelik, Joanna; Fuchs, Michael; Krämer, Michael; et al. Coupling certain pain medications with soothing music can alleviate pain, report a team of researchers from University of Utah Health. Their study used mice, some of which listened to ambient noise and some of which listened to three hours of Mozart daily for three weeks. In an experiment that was repeated four times, each group was given a suboptimal dose of ibuprofen, cannabidiol, levetiracetam, and the galanin analog NAX 5055. When paired with music, ibuprofen curbed pain responses in an inflammation model by 93 percent compared with the pain reliever alone. Cannabidiol and galanin analog NAX 5055 also had a significant benefit when combined with music, bringing inflammation down by 70 percent. In the mouse surgical pain model, meanwhile, music by itself provided 77 percent relief. "We know these drugs work without music, but they can produce toxicity and adverse effects," said study senior author Grzegorz Bulaj, PhD, an associate professor at the university. "The holy grail is to combine the right drug with this new paradigm of music exposure, so we do not need as much drug for analgesic effects." The research appears online in Frontiers in Neurology. From "Pairing Music with Medication Offers Potential Therapeutic Strategy to Manage Pain"